Yes, I have the Traditional Scottish Attire. The tartan I wear is the Davidson Tartan. This comes complete with black jacket or vest, kilt, dress shirt, tie, sporran, hose (fancy socks) and gillie brogues (shoes). As I appear in Photo page. What tunes can you play? Depending on the occasion, I can perform many different tunes. These include Amazing Grace, Scotland the Brave, Flowers of the Forest and yes the Traditional Wedding March for the Bride. Have a listen to the Tunes page. This will vary on the length of the occasion but you will be given a firm quote: a confirmation letter noting location, date, time, tunes requested and the $ amount (if you require). Yes, I play the Shuttle pipes. This instrument is a much mellower sound compared to the Highland Bagpipes. Can you get other players/band or dancers? 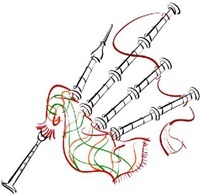 Yes, I was the Band Manager of the White Spot Pipe Band, and ex-Pipe Major of Greighlan Crossing Pipe Band so I have connections to various levels of players.